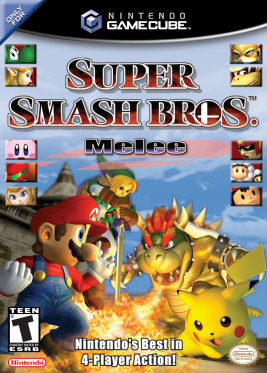 Super Smash Brothers Melee, a Player\'s Choice game, is also one of the first games released on the GameCube. This title is somewhat of a sequel to \'Super Smash Brothers\' on the Nintendo64. While \'Super Smash Brothers\' was pretty good, with nice graphics, awesome levels, and great playability, The Big N has re-created this hit on the new (at the time it was released) GameCube, and pretty much everything has been updated: fresh new graphics, a nice combat engine, amazing levels, and great music. In SSBM, starting a game is pretty basic. First, you need to assume the role of one of over 20 characters (most of which need to be unlocked). The ones you start out with are the classics, such as Mario, Peach, Donkey Kong, Fox, and Link, to name a few. As you progress, you will find some more obscure ones, though. Once you choose your player, you need to select a level. There are also more than 20 levels to choose from, most needing to be unlocked. The levels that you start with are awesome: Peach\'s Castle, Rainbow Cruise, Fox\'s Ship, Dream Land, Fountain of Dreams and many, many more. Once you have made the tough decision on which stage to play on, you can start playing! See? I told you it was easy. Controlling your character is a snap; \'A\' punches, \'B\' does a personalized power attack, and \'X\' jumps. Now, I know that using the \'X\' button to jump sounds weird, but trust me; it suits the game very well. In addition to those buttons, the left or right shoulder buttons dodge, grab, or activate your shield. Using the control stick in unison with the \'A\' or \'B\' buttons will alter the move. For example, pushing the control stick up and pressing the \'A\' button will attack upward. The graphics in this game are top-notch, even when you pause the game and zoom in on details such as the texture of Mario\'s denim overalls, or Fox\'s fur. Each of the levels and characters are amazingly detailed, from the rushing water in the DK Jungle level to the pattern on Zelda\'s dress. SSBM is as much of an aural delight as it is visually, maybe even better. All of the sounds are nicely done and fit well into the game; from the \'clink\' of Link\'s sword to the footsteps of Bowser. The music in SSBM is so awesome, you will want to run up to Redmond, Washington to thank The Big N that the GameCube uses a CD and not a cartridge. Remember how in the old N64 games, the music was like a MIDI soundtrack? Well, not anymore, at least with this game. Also, the favorite old Nintendo songs like the DK Theme and the Mario Theme are in this game. The entire soundtrack is nicely done, and probably the best music I have heard in a video game, next to Metroid Prime. The game modes in here are quite abundant; there are 3 main one player modes. In \'Adventure\', you play through a series of levels with different challenges, such as getting to the top of a level to prevent getting exploded to bits. In \'Classic\', you defeat each enemy one at a time, replicating the old Single Player game on SSB. The other mode, I don\'t want to tell you about because it needs to be unlocked. There are also so many other one player modes, too, but those ones that I just mentioned are the biggies.